The Team Sky rider is leading the second rider, Tom Dumoulin, by one minute, 51 seconds - and Tour convention means that Mr Thomas only needs to finish the stage in Paris to win the overall race. The final stage - which will end, as usual on the Champs-Elysées - is taking place today. 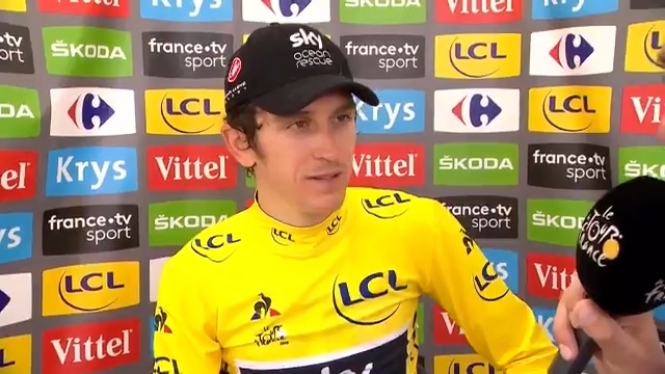 Mr Thomas has already proven emotional at his soon-to-be-overall-win of the famous yellow jersey. He added: “I felt good, I felt strong...I can’t speak. I believed I could beat the guys here, but to do it on the biggest stage of all, over three weeks, it’s insane. The last time I cried was when I got married. Don’t know what’s happening to me." This is the ninth Tour for the rider, who first rode it in 2007, when he finished 140th of 141 finishers. He joined Team Sky in 2010. His previous Tours have not been without incident; in 2013 the rider broke his pelvis, and last year had to abandon the race after breaking his collarbone. He had previously been one of the riders to help Team Sky star Mr Froome achieve each of his four Tour wins, and before this year’s win, Mr Thomas’ best finish had been 15th, on two occasions. At this point, Mr Dumoulin is ahead of Mr Froome by one second, while Mr Froome is ahead of Slovenia’s Primoz Roglic, and will likely take third place.